More than a hundred bikers took to the streets of Bristol recently to celebrate the life of a well-known motorcycle enthusiast. Dozens of motorcycles paraded through South Bristol on Thursday October 24 to accompany the funeral procession of 70-year-old Jim Malin from Stockwood, well known in the community as one of the founding members of Hartcliffe Motorcycle Club. Footage from the arrival at South Bristol Crematorium shows the crowd of bikes following closely behind the sidecar hearse, after travelling in the motorcade from Keynsham to Bedminster Down. A Hell's Angels leader accused of attacking a biker outside a pub told a court he "wasn't put on this planet to scare people". Prosecutor Nicolas Cooper told the Old Bailey Matthew Barnes, 48, had led a "mob" to confront Christopher Harrison. But Mr Barnes denied intimidating anyone and said Mr Cooper's suggestion was "absurd". Mr Barnes, from Hastings, and Oliver Wilkinson, of St Leonards, deny causing grievous bodily harm with intent. They are both accused of attacking Mr Harrison outside The Carlisle pub in Hastings in February 2016, causing him serious eye injuries. Mr Harrison has alleged former Sussex chapter president Mr Barnes head-butted him and Mr Wilkinson, 50, of Duke Road, St Leonards, punched him. A Hells Angels biker attacked a man outside a pub and then told a bartender her children would be next if she told police, the Old Bailey heard. Jurors have heard Christopher Harrison's eyeballs were ruptured in the attack in February 2016. Matthew Barnes, of Hastings, and Oliver Wilkinson, of St Leonards, both deny grievous bodily harm with intent. Anne Penfold, bartender at the Carlisle pub in Hastings, said Mr Wilkinson threatened her. Jurors have heard Mr Barnes was the president of the Sussex Hells Angels motorcycle club and Mr Wilkinson was part of the club's "support crew". The court has been told Mr Harrison was targeted because he did not want to join the club. Miss Penfold said when she found Mr Harrison "his body was curled in a foetal position". She said: "He was unconscious, breathing, although barely. He eyes were so very badly bruised." Two Hells Angels bikers launched an attack on a man that was so "ferocious" his eyeballs ruptured, a court heard. Matthew Barnes, 47, of Victoria Avenue, Hastings, and Oliver Wilkinson, 49, of Duke Road, St Leonards-on-Sea, deny grievous bodily harm with intent. The Old Bailey was told that Christopher Harrison was blinded in the attack outside The Carlisle pub on Hastings seafront in February 2016. He was targeted because he did not want to join the bikers' club, jurors heard. Opening the case, prosecutor Nicholas Cooper said Mr Barnes was the president of the Sussex Hells Angels motorcycle club and Mr Wilkinson was part of the club's "support crew". They had gathered at The Carlisle pub with other members and associates, where a band was playing. Mr Harrison was also present and although a biker was not a member of the Hells Angels, the court was told. (photo gallery)---LEATHER-clad bikers roared into Sunderland on Saturday morning to welcome tall ships to the town ahead of a major international sailing event. On July 11 a magnificent fleet of sailing vessels will arrive at the North-East coast for the UK’s largest, free, family festival; the Tall Ships Races Sunderland 2018. And with just three months to go, around 250 of the North East of England’s motorcycle fraternity staged their own special welcome this weekend. The North East Coalition of Motorcycle Clubs, hosted by the Hells Angels MC Tyne & Wear formed a guard of honour for the incoming Tall Ships with leather and chrome. The Hells Angels have a strong link to naval heritage as their Sunderland Club Hose, Angels Place, was used to house and rehabilitate injured sailors from the epic Battle of Trafalgar. 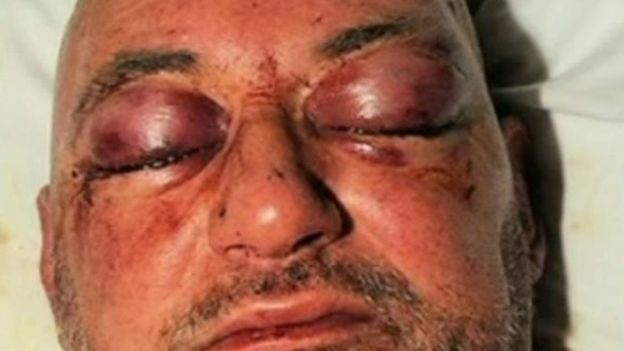 Christopher Harrison, 53, was left unconscious in a pool of blood when Angels leader Matthew Barnes, 46, and other gang members allegedly targeted his eyes to stop him identifying them after the attack. He suffered from two ruptured eyeballs and told how the blows were 'raining in' on him after an argument with Mr Barnes' co-defendant Oliver Wilkinson, 49, at the Carlisle Pub in Hastings. Around 200 people had gathered at the biker pub to watch punk band named '90% Proof' play, with around 20 Hells Angels attending, a court heard. With the music blaring, Mr Wilkinson took Mr Harrison, nicknamed "Swaggers", outside into the picnic area of the pub for a chat. The pair had once been friends, but had fallen out over the death of a fellow biker called "Papa Smurf" several years earlier. London’s Outlaws motorcycle club hasn’t disappeared, it’s moved. And it’s backed now by a new puppet club called the Filthy 15, police confirm. With the recent arrests of four members and the closing of a clubhouse only months after opening, it appeared the Outlaws’ resurgence — in a city supposedly dominated by the Hells Angels —was short-lived. But what sources say is a new and bigger clubhouse has opened up, with about 15 full patch members, and half as many Filthy 15 puppet club members. Meanwhile, what may be early tensions between the Outlaws and Hells Angels have spilled into the Elgin-Middlesex Detention Centre, the provincial jail in London, sources say.